The Galapagos Islands are world-famous as a laboratory of biological evolution. Some 30% of the plants, 80% of the land birds and 97% of the reptiles on this remote archipelago are found nowhere else on Earth. Perhaps the most striking example is the islands’ iconic giant tortoises, which often live to ages over 100 years in the wild. Multiple species of these mega-herbivores have evolved in response to conditions on the island or volcano where each lives, generating wide variation in shell shape and size. Over the past 200 years, hunting and invasive species reduced giant tortoise populations by an estimated 90%, destroying several species and pushing others to the brink of extinction, although a few populations on remote volcanoes remained abundant. Now however, the tortoise dynasty is on the road to recovery, thanks to work by the Galapagos National Park Directorate, with critical support from nonprofits like the Galapagos Conservancy and advice from an international team of conservation scientists. Together we are advancing a broad multiyear program called the Giant Tortoise Restoration Initiative, overseen by Washington Tapia, Linda Cayot and myself with major collaboration from Gisella Caccone at Yale University. Using many novel strategies, the initiative helps guide the Galapagos National Park Directorate to restore viable, self-sustaining tortoise populations and recover the ecosystems in which these animals evolved. As many as 300,000 giant tortoises once roamed the Galapagos Islands. Whalers and colonists started collecting them for food in the 19th century. Early settlers introduced rats, pigs and goats, which preyed upon tortoises or destroyed their habitat. As a result, it was widely concluded by the 1940s that giant tortoises were headed for oblivion. After the Galapagos National Park was established in 1959, park guards halted killing of tortoises for food. Next, biologists at what was then known as the Charles Darwin Research Station did the first inventory of surviving tortoises. They also initiated a program to help recover imperiled species. One species, the Pinzon Island tortoise, had not produced any juveniles for over 100 years because nonnative black rats were preying on hatchlings. In 1965 park guards started methodically removing eggs from tortoise nests, rearing the offspring to “rat-proof” size in captivity and releasing them back into the wild. More than 5,000 young tortoises have been repatriated back to Pinzon Island. Many are now adults. This program is one of the most successful examples of “head-starting” to save a species in conservation history. The Española tortoise, which once numbered in the thousands, had been reduced to just 15 individuals by 1960. Park guards brought those 15 into captivity, where they have produced more than 2,000 captive-raised offspring now released onto their home island. All 15 survivors are still alive and reproducing today, and the wild population numbers more than 1,000. This is one of the greatest and least-known conservation success stories of any species. Over the past 150 years, goats brought to the islands by early settlers overgrazed many of the islands, turning them into dustbowls and destroying forage, shade and water sources that tortoises relied on. In 1997 the Galapagos Conservancy launched Project Isabela, the largest ecosystem restoration initiative ever carried out in a protected area. Over a decade park wardens, working closely with Island Conservation, used high-tech hunting tactics, helicopter support and Judas goats – animals fitted with radio collars that led hunters to the last remaining herds – to eliminate over 140,000 feral goats from virtually all of the archipelago. Building on lessons learned from Project Isabela, the Galapagos National Park Directorate and Island Conservancy then eradicated nonnative rats from Pinzón Island in 2012, enabling tortoise hatchlings to survive and complete their life cycle again for the first time in a century. The argument for tortoise conservation has been strengthened by reconceptualizing giant tortoises as agents whose actions shape the ecosystems around them. Tortoises eat and disperse many plants as they move around – and they are more mobile than many people realize. By attaching GPS tags to tortoises, scientists with the Galapagos Tortoise Movement Ecology Programme have learned that tortoises migrate tens of kilometers up and down volcanoes seasonally to get to new plant growth and nesting sites. As they move, tortoises crush vegetation. They may be an important factor in maintaining the native savannah-like ecosystems on the islands where they live. When tortoises are scarce, we think that shrubs sprout up, crowding out many herbaceous plants and other animal species. We need data to support this theory, so we have constructed an elaborate system of “exclosures” on two islands that wall tortoises out of certain areas. By comparing vegetation in the tortoise-free zones to conditions outside of the exclosures, we will see just how tortoises shape their ecosystems. Restoring ecosystems on islands where tortoises have gone extinct requires more drastic steps. Santa Fe Island lost its endemic giant tortoises more than 150 years ago, and its ecosystems are still recovering from a scourge of goats. Park managers are attempting to restore the island using an “analog,” nonnative species – the genetically and morphologically similar Española tortoise. In 2015 the Galapagos National Park Directorate released 201 juvenile Española tortoises in the interior of Santa Fe Island. They all appear to have survived their first year there, and 200 more are scheduled for release in 2017. Española tortoises are still endangered, so this strategy has the extra value of creating a reserve population of them on Santa Fe island. On Pinta Island, which also has lost its endemic tortoise, park managers have released sterilized nonnative tortoises to serve as “vegetation management tools” that can prepare the habitat for future introductions of reproductive tortoises. These initiatives are some of the first-ever to use analog species to jump-start plant community restoration. The endemic tortoises of Floreana Island are also considered to be extinct. 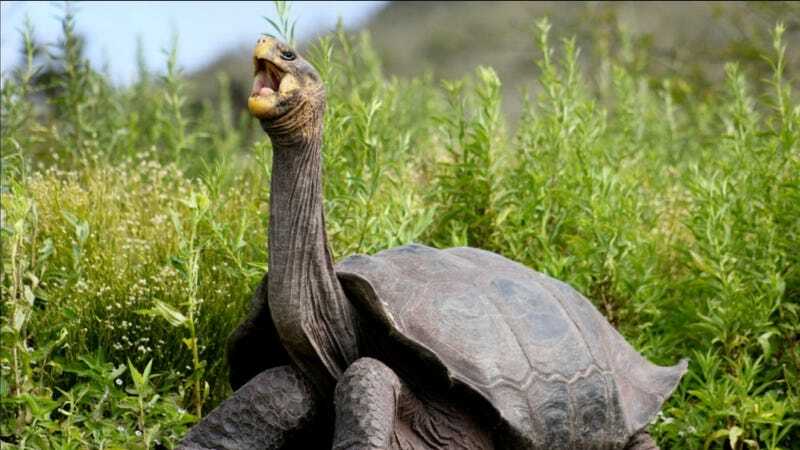 But geneticists recently discovered that in a remote location on Isabela Island, tortoises evidently had been translocated from around the archipelago during the whaling era. In a major expedition in 2015, park rangers and collaborating scientists removed 32 tortoises from Isabela Island with shell features similar to the extinct Pinta and Floreana species. Now the geneticists are exploring the degree of interbreeding of these 32 distinct tortoises between the extinct species and native Wolf Volcano tortoises. We are hoping to find a few “pure” survivors from the extinct species. Careful and selective breeding of tortoises in captivity with significant levels of either Pinta or Floreana ancestry will follow to produce a new generation of young tortoises to be released back on Pinta and Floreana Islands and help their ecosystems recover. Lonesome George, the last known living Pinta Island giant tortoise, died in 2012 after decades in captivity. His frozen remains were transferred to the United States and taxidermied by world-class experts. In mid-February Lonesome George will be returned to Galapagos once again and ensconced as the focus of a newly renovated park visitation center. Some 150,000 visitors each year will learn the complex but ultimately encouraging story of giant tortoise conservation, and a beloved family member will rest back at home again. This article is reproduced with permission from The Conversation. Find the original story here. James P. Gibbs works for the State University of New York's College of Environmental Science and Forestry and serves in a remunerated position as Adjunct Scientist for the Galapagos Conservancy. He is also a research collaborator with the Giant Tortoise Movement Ecology Program. He receives funding from the National Science Foundation (DEB 1258062) and the Galapagos Conservancy for the work described here.